Cheered by their owner, Bollywood star Abhishek Bachchan and his wife Aishwarya, Pink Panthers Jaipur overcame stiff resistance from lowly Puneri Paltan to post a 33-27 victory and maintain their top position in the Pro Kabaddi League at the Sawai Mansingh Indoor Stadium, in Jaipur. 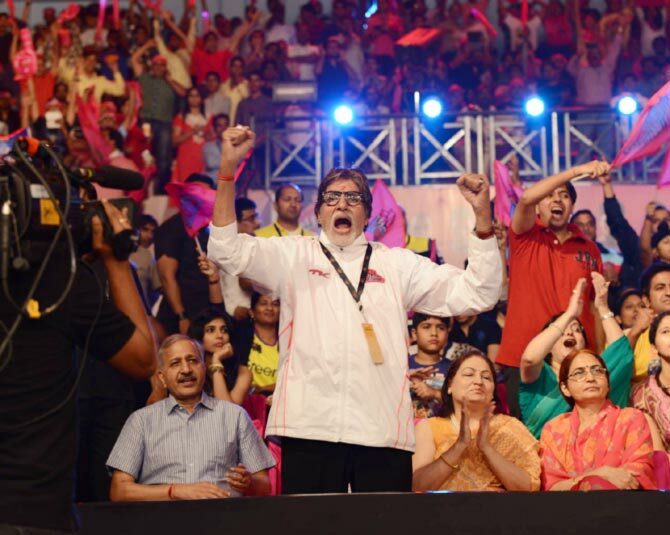 Bollywood icon Amitabh Bachchan was at his animated best as he cheered every point that the Panthers scored. The winners were leading 20-10 at the breather, but Puneri Paltan, who are languishing at the bottom of the table with only 16 points from 12 matches, made a spirited come back. They shot to a 22-21 lead with 13 minutes remaining. But Pink Panthers gained parity at 22-22 and, although the visitors fought tooth and nail for a while, decisive raids by Jasvir and Maninder helped the hosts clinch the tie on Saturday. With a score of 33-27, Jaipur became the third team to join U Mumba and Telegu Titans. They turned their home into a fortress, not losing a single game at their home venue. A contest between the top and bottom ranked teams in the league table, the home-team did not disappoint. Being the only team to have qualified for the semi-finals, the Jaipur team played like champions, overpowering Puneri Paltan from the word go. Though out of the running for the semis, the Pune team looked strong but fell just short of the Panthers. PHOTOS: Kohli selects Anushka as his 'bride' during IPL Swayamwar!